Ottoman Influences on Islamic Batik from Indonesia, a Context of Understanding – A dynamic relationship has existed between Turkey and Indonesia for more than 500 years; this may be observed in Ottoman influences on Islamic calligraphic batik. Throughout the Indonesian archipelago calligraphic batik textiles have been used during sacred ceremonies. Such cloths were made primarily in Jambi, west Sumatra. They were patterned by hand painted wax resist, tulis. These batiks absorbed stylistic influences from the outside world through trade, pilgrimage and politics. 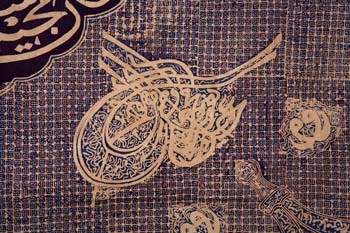 Ottoman influences on batik kaligrafi include the use of a tugra, the official signature of the emperor, as an icon. With many layers of meaning, it served as a statement of political alliance but also as a talismanic device. One need not be literate to recognize the power of such a striking graphic device to ward off the evil eye. Thomas Murray attended UC Berkeley where he took classes in Psychology and Anthropology with a Pre-Medicine focus. He began his Asian travels in 1978. For 35 years he has supported his independent research through the sale of tribal art and textiles with a primary focus on Indonesia; he has objects in more than 30 museums on four continents. A HALI contributing editor for the last 20 years, he serves as the “in-house” expert on all ethnographic textiles with more than 50 publications and has lectured widely. Murray was recently appointed by President Obama to the Cultural Property Advisory Committee at the State Department.